This is a consignment item. A 3% buyer's premium ($51.00) will be charged at checkout. This is a consignment item. A 3% buyer's premium ($55.47) will be charged at checkout. This is a consignment item. A 3% buyer's premium ($59.85) will be charged at checkout. This is a consignment item. A 3% buyer's premium ($26.97) will be charged at checkout. This is a consignment item. A 3% buyer's premium ($28.98) will be charged at checkout. "Out of Hell--a Hero!" Script by Archie Goodwin, pencils by George Tuska, inks by Billy Graham. NOTE: Roy Thomas and John Romita are credited for their "considerable creative contributions." When Lucas, an innocent man, is sent to jail for a crime he did not commit, he decides he has nothing left to loose. Subjecting himself to unorthodox experiments, this inmate is endowed with great physical strength and nigh-unbreakable skin. No walls and bars on Earth can hold him. 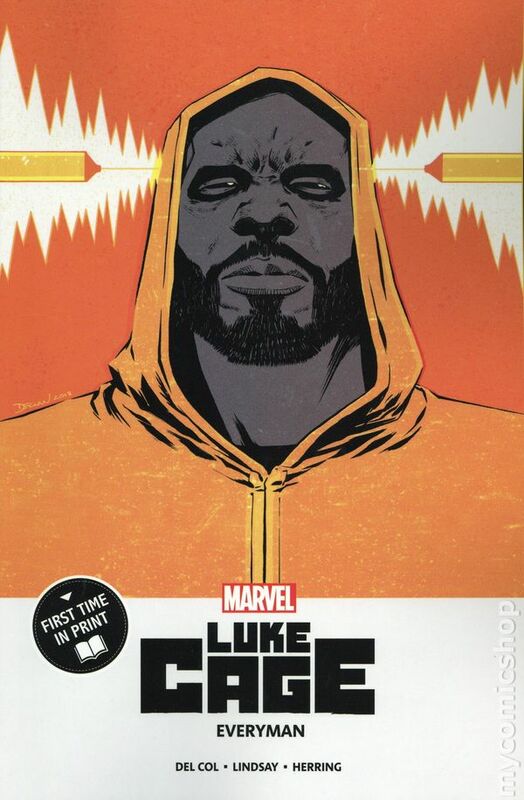 Now, as Luke Cage, he is known as the Hero for Hire, and he's here to clean up the "Mean Streets," one criminal at a time. Cover price $0.20. Reprinting Hero For Hire (1972) #1 "Out of Hell--a Hero!" Written by Archie Goodwin. Art by George Tuska and Billy Graham. When Lucas, an innocent man, is sent to jail for a crime he did not commit, he decides he has nothing left to loose. Subjecting himself to unorthodox experiments, this inmate is endowed with great physical strength and nigh-unbreakable skin. No walls and bars on Earth can hold him. Now, as Luke Cage, he is known as the Hero for Hire, and he's here to clean up the "Mean Streets," one criminal at a time. 28 pages, full color. Rated T Cover price $1.00. Reprints Fantastic Four (1961) 168: "Where Have All the Powers Gone?" Part 1 of 3. Written by Roy Thomas. Art by Rich Buckler and Joe Sinnott. Cover by Rich Buckler and Joe Sinnott. After being exposed to excessive gamma radiation from the Hulk last issue, the Thing has reverted back to normal Ben Grimm! And now Ben and his girlfriend, Alicia Masters, have a chance to build a new life together. But there may be someone (operating behind the scenes) that doesn't want Ben and Alicia to have a new anything! Meanwhile, Reed decides to replace the Thing right away. 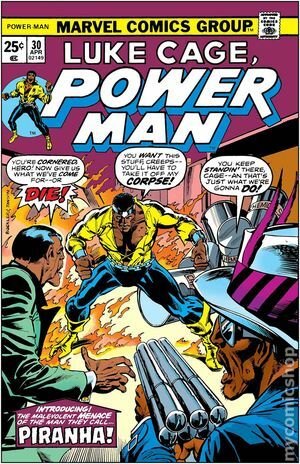 Someone powerful...so how about Power Man? Luke Cage accepts Mr. Fantastic's offer; and when the Wrecker starts creating havoc at a local bank, Power Man gets his first test with the Fantastic Four! 28 pages, full color. Rated T. Cover price $1.00. Written by David Walker. Art by Nelson Blake. Cover by Rahzzah. CAGED VENGEANCE! Dr. Noah Burstein, the man who made Luke Cage into the unbreakable hero he is today, is dead. When Luke goes down to New Orleans for the funeral, he finds The Big Easy to be pretty &$#% difficult. Mysterious billionaires, a woman with a secret, amped-up gangs and a shadowy figure all lead Luke to the conclusion that there's more to his father-figure's death than meets the eye. He's looking for answers, and it's a bad day for anyone in his way! 28 pages, full color. Rated T+ Cover price $3.99. Limited 1 for 50 Retailer Incentive Variant Cover. Written by David Walker. Art by Nelson Blake. Cover by Mike Deodato. CAGED VENGEANCE! Dr. Noah Burstein, the man who made Luke Cage into the unbreakable hero he is today, is dead. When Luke goes down to New Orleans for the funeral, he finds The Big Easy to be pretty &$#% difficult. Mysterious billionaires, a woman with a secret, amped-up gangs and a shadowy figure all lead Luke to the conclusion that there's more to his father-figure's death than meets the eye. He's looking for answers, and it's a bad day for anyone in his way! 28 pages, full color. Rated T+ Cover price $3.99. Limited 1 for 25 Retailer Incentive Variant Cover. Written by David Walker. Art by Nelson Blake. Cover by Leroy Davis. CAGED VENGEANCE! Dr. Noah Burstein, the man who made Luke Cage into the unbreakable hero he is today, is dead. When Luke goes down to New Orleans for the funeral, he finds The Big Easy to be pretty &$#% difficult. Mysterious billionaires, a woman with a secret, amped-up gangs and a shadowy figure all lead Luke to the conclusion that there's more to his father-figure's death than meets the eye. He's looking for answers, and it's a bad day for anyone in his way! 28 pages, full color. Rated T+ Cover price $3.99. Limited 1 for 15 Retailer Incentive Variant Cover. Written by David Walker. Art by Nelson Blake. Cover by Neil Adams. CAGED VENGEANCE! Dr. Noah Burstein, the man who made Luke Cage into the unbreakable hero he is today, is dead. When Luke goes down to New Orleans for the funeral, he finds The Big Easy to be pretty &$#% difficult. Mysterious billionaires, a woman with a secret, amped-up gangs and a shadowy figure all lead Luke to the conclusion that there's more to his father-figure's death than meets the eye. He's looking for answers, and it's a bad day for anyone in his way! 28 pages, full color. Rated T+ Cover price $3.99. Written by David Walker. Art by Nelson Blake. 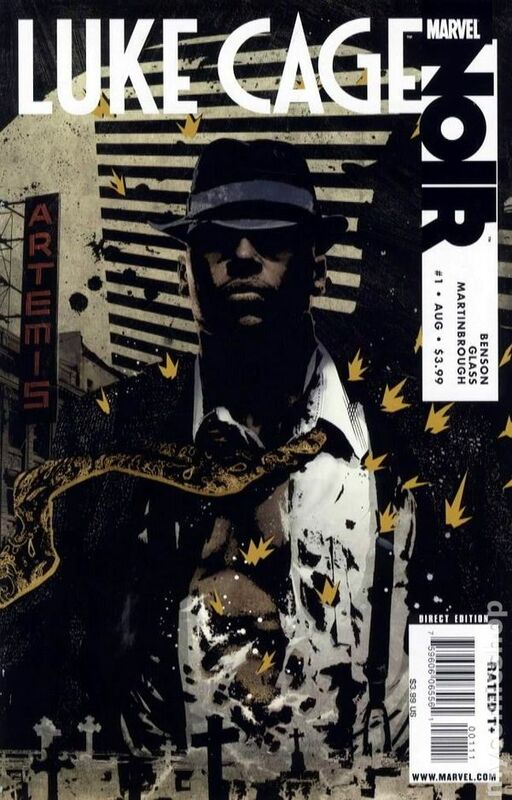 Cover by Tim Bradstreet. CAGED VENGEANCE! Dr. Noah Burstein, the man who made Luke Cage into the unbreakable hero he is today, is dead. When Luke goes down to New Orleans for the funeral, he finds The Big Easy to be pretty &$#% difficult. Mysterious billionaires, a woman with a secret, amped-up gangs and a shadowy figure all lead Luke to the conclusion that there's more to his father-figure's death than meets the eye. He's looking for answers, and it's a bad day for anyone in his way! 28 pages, full color. Rated T+ Cover price $3.99. Cover by TIM BRADSTREET. Written by MIKE BENSON and ADAM GLASS. Art by SHAWN MARTINBROUGH. 'MOON OVER HARLEM,' PART 1-A lot can change in ten years. And rarely for the better. 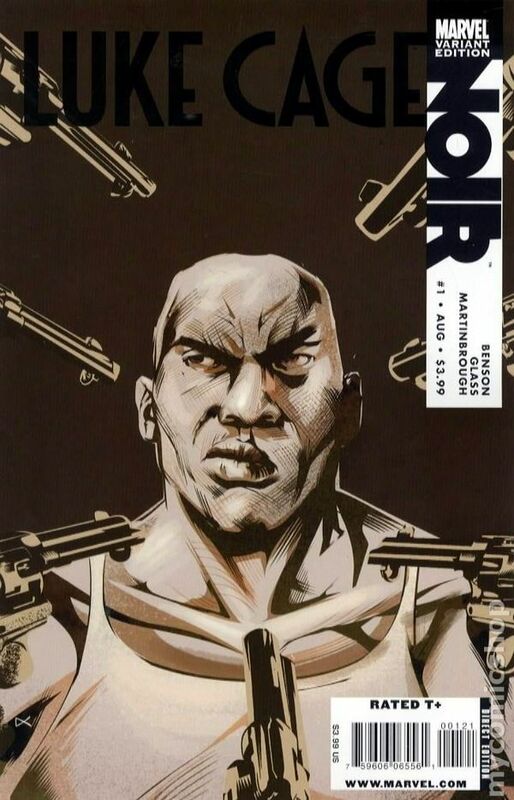 Local legend, Luke Cage, invincible, unstoppable, unflappable, finds that out the hard way when he returns to the mean streets of Prohibition-era Harlem after a ten-year stretch in Riker's Island. All he wants is to be back in the loving arms of his woman, but certain powerful men have different plans for Cage. Willis Stryker, Cage's childhood friend turned Godfather of Harlem, wants him on his crew, and under his thumb. And wealthy white socialite Randall Banticoff, whose wife is now very dead, murdered in a Harlem alley, wants Cage to investigate her death. Cage is about to learn that coming home is never easy, and to survive he might just have to kill a whole lot of people. 32 PGS./Rated T+ ...$3.99 Cover price $3.99. Variant Cover by DENNIS CALERO. Written by MIKE BENSON & ADAM GLASS Penciled by SHAWN MARTINBROUGH 'MOON OVER HARLEM,' PART 1-A lot can change in ten years. And rarely for the better. 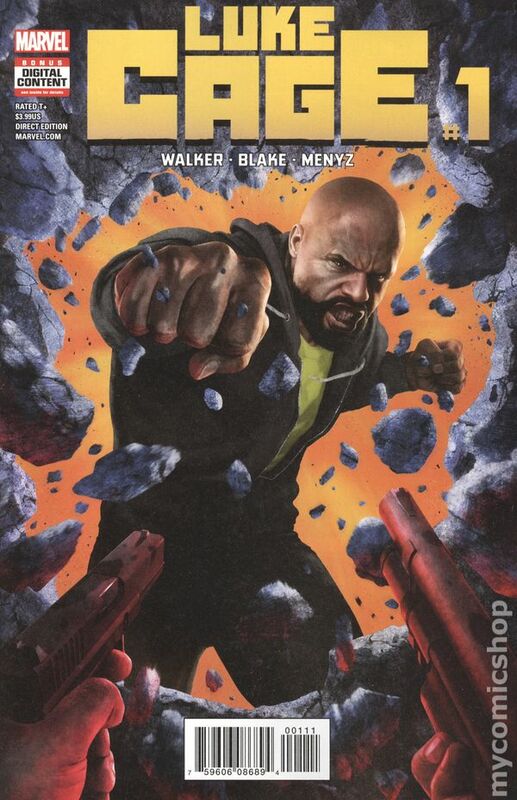 Local legend, Luke Cage, invincible, unstoppable, unflappable, finds that out the hard way when he returns to the mean streets of Prohibition-era Harlem after a ten-year stretch in Riker's Island. All he wants is to be back in the loving arms of his woman, but certain powerful men have different plans for Cage. Willis Stryker, Cage's childhood friend turned Godfather of Harlem, wants him on his crew, and under his thumb. And wealthy white socialite Randall Banticoff, whose wife is now very dead, murdered in a Harlem alley, wants Cage to investigate her death. Cage is about to learn that coming home is never easy, and to survive he might just have to kill a whole lot of people. 32 PGS./Rated T+ ...$3.99 Cover price $3.99. Written by JOHN ARCUDI. Art and Cover by ERIC CANETE. 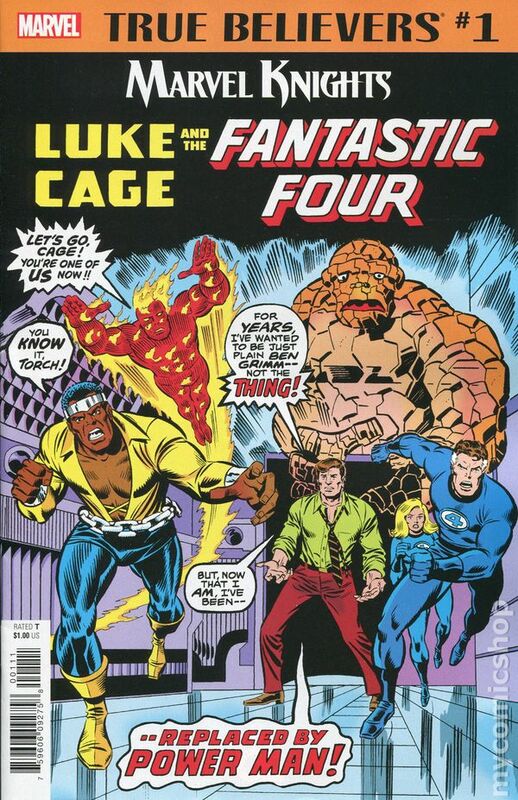 When an old friend from Luke Cage's past is put in the hospital by a vicious attack, Cage leaves his New York City, Avengers Assemblin' adventure-filled life for the cold, harsh and mean streets of North Philadelphia. But what's brought HAMMERHEAD to town as well? 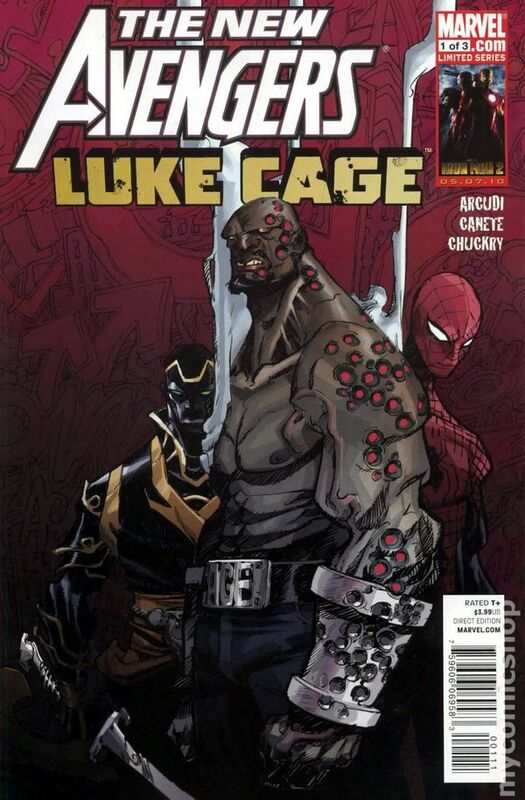 JOHN ARCUDI (Wednesdays Comics) and ERIC CANETE (AMAZING SPIDER-MAN) team up to bring you this hard hitting, two-fisted look at the seedier sides of the Marvel U as the original Hero for Hire gets back to work in NEW AVENGERS: LUKE CAGE! 32 pages, full color. Cover price $3.99. Written by ADAM GLASS & MIKE BENSON Penciled by DALIBOR TALAJIC Cover by MARKO DJURDJEVIC EXPLODING FROM THE PAGES OF NEW AVENGERS... What makes someone a hero? An Avenger? Is it super-powers? An?indomitable will? An innate sense of right and wrong? 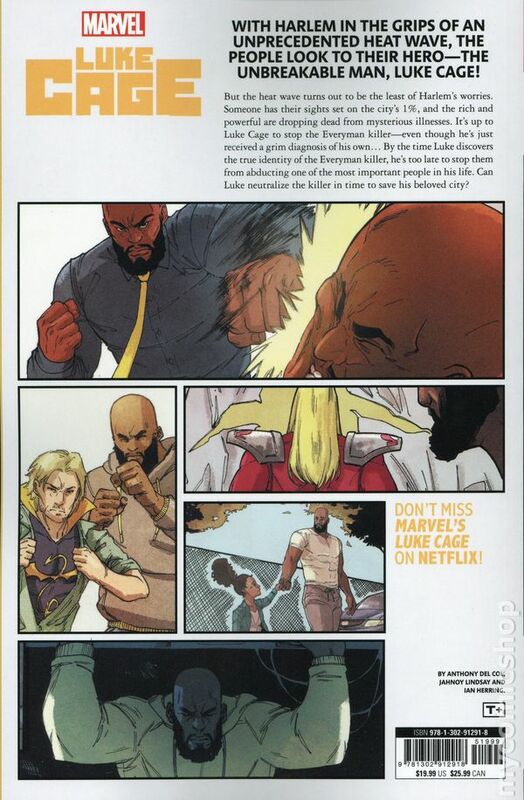 For Luke Cage its one terrible mistake that has haunted him his entire life. But can a lifetime of good deeds make up for his years spent on the other side of the law? And will that past ever let him go, or will it tear him to pieces? 40 PGS./All-New Material/No Reprints/Rated T+ Cover price $3.99. Volume 1 - 1st printing. 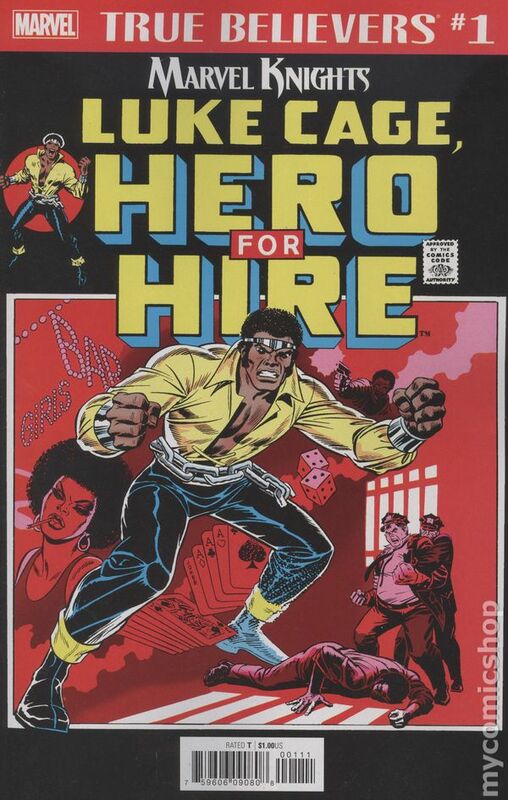 Collects Power Man and Iron Fist (1972-1986 Hero for Hire) #1-16. 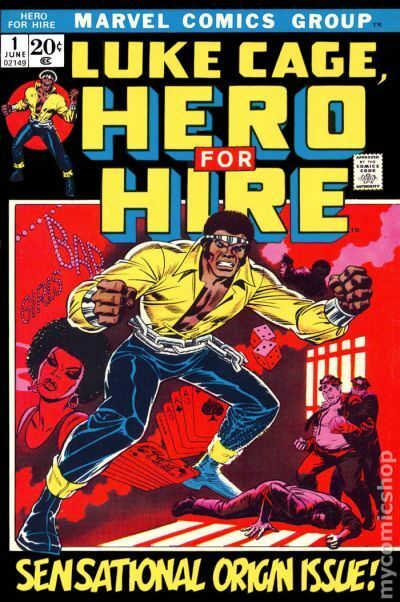 Luke Cage burst onto the comics scene in 1972 as the "Hero for Hire." Equal parts Marvel Method and Blaxploitation boldness, he was a new kind of hero for a new era. 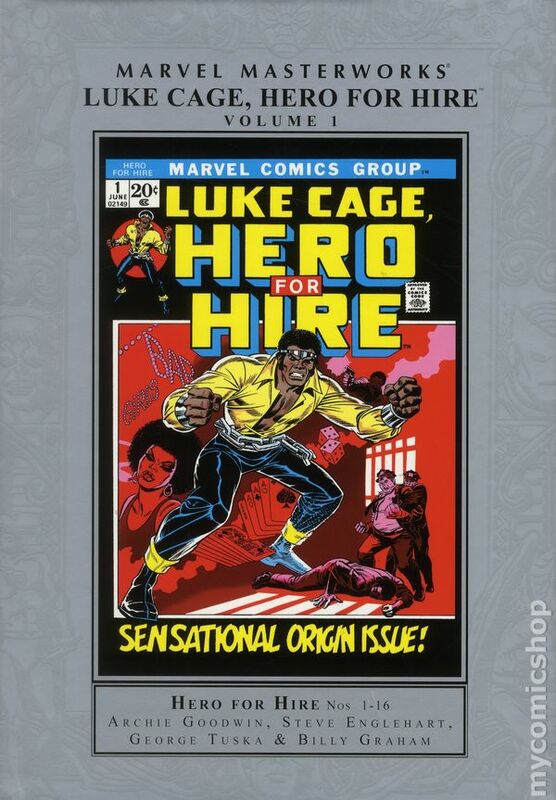 Now, the Marvel Masterworks proudly present the complete Luke Cage, Hero for Hire - the historic first title to headline an African-American super hero - in one hardcover volume! Cage's adventures depicted New York City's 1970s grit and the plight of its people unlike any other, all while incorporating larger-than-life villains including Black Mariah and Doctor Doom. From Cage's origin story to his first exploits as the hard-as-steel hero, each issue has been painstakingly restored and collected here in color for the very first time! Hardcover, 336 pages, full color. Cover price $75.00. Written by Anthony Del Col. Art by Jahnoy Lindsay. Cover by Declan Shalvey. 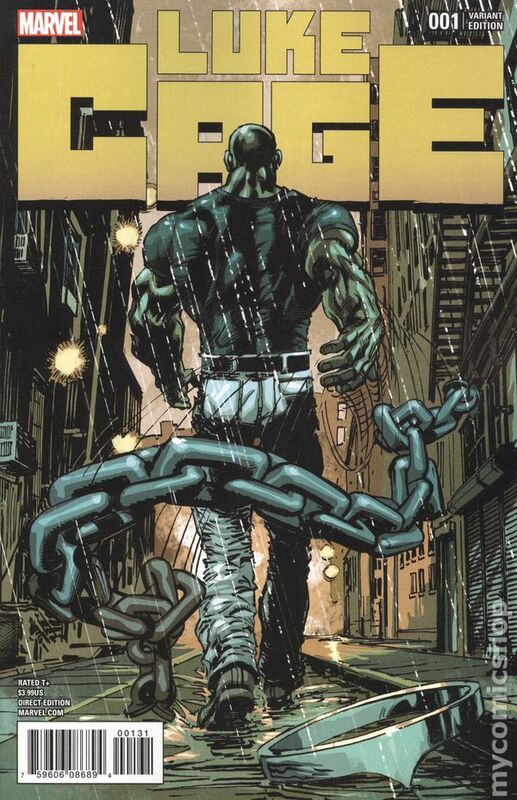 With Harlem in the grips of an unprecedented heat wave, the people look to their hero - the unbreakable man, Luke Cage! But the heat wave turns out to be the least of Harlem's worries. Someone has their sights set on the city's 1%, and the rich and powerful are dropping dead from mysterious illnesses. 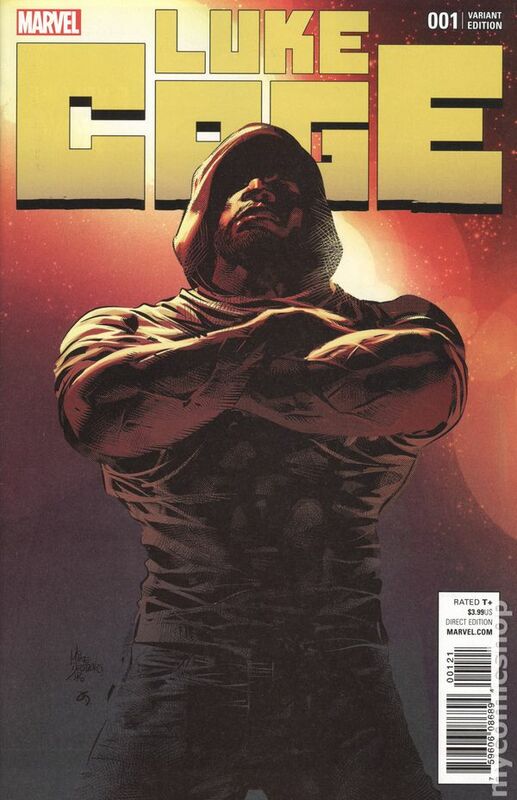 It's up to Luke Cage to stop the Everyman Killer - even though he's just received a grim diagnosis of his own... By the time Luke discovers the true identity of the Everyman Killer he's too late to stop them from abducting one of the most important people in his life. Can Luke neutralize the killer in time to save his beloved city? Volume 1 - 1st Printing. Collects Power Man and Iron Fist (1972-1986 Hero for Hire) #1-27. Written by ROY THOMAS, JOHN ROMITA, ARCHIE GOODWIN, STEVE ENGLEHART, GERRY CONWAY, TONY ISABELLA and LEN WEIN. Art by GEORGE TUSKA and BILLY GRAHAM. 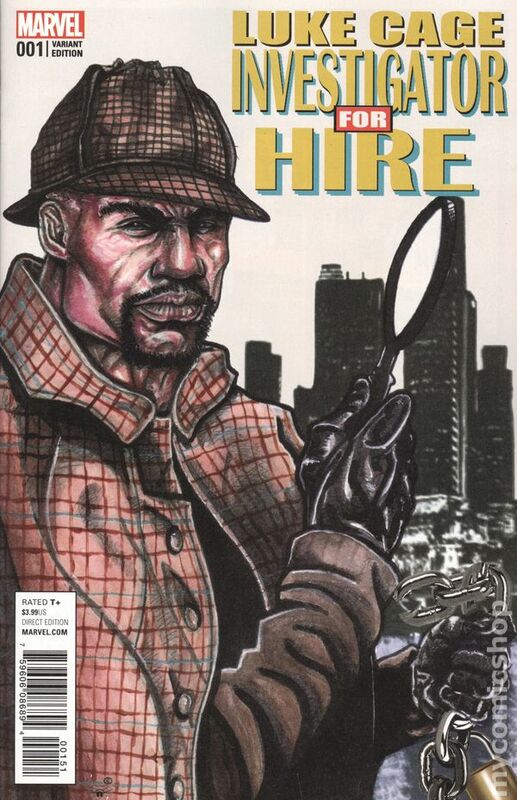 Cover by JOHN ROMITA SR.
Look out, world, here he comes - Luke Cage, Hero for Hire - and bullets won't stop him! 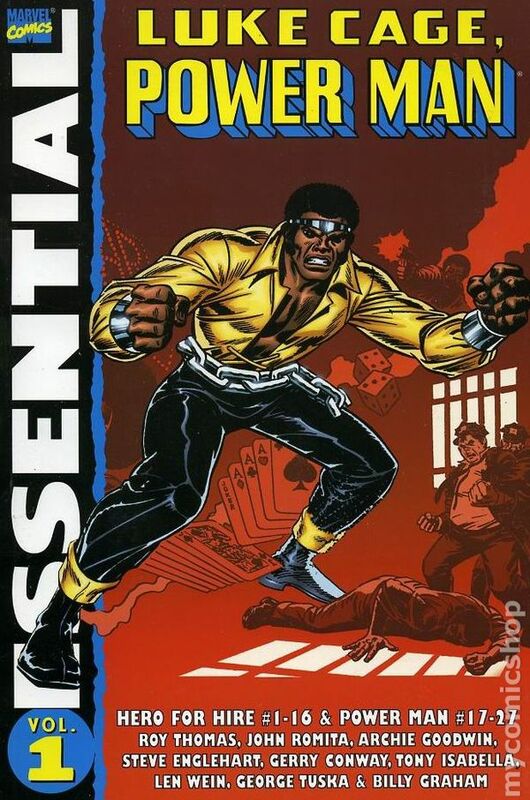 The early adventures of comics' first and foremost black superstar of the seventies are collected for the first time in one volume as Power Man defends his home turf against the likes of Diamondback, Mace, Black Mariah, Doctor Doom, Senor Suerte, Chemistro, Lionfang, Steeplejack, Cottonmouth and more! Guest-starring the Fantastic Four, Spider-Man, and Iron Man! 1st printing. 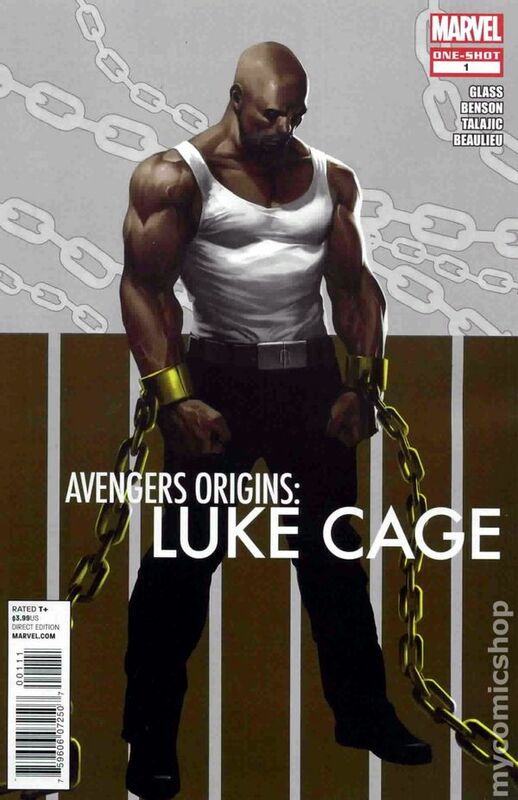 Collects Avengers Origins: Luke Cage (2011), New Avengers (2005-2010 1st Series) #22 and 49, New Avengers: Luke Cage (2010) #1-3 and Marvel Team-Up (1972-1985) Annual #4. Written by Brian Michael Bendis, ADAM GLASS, MIKE BENSON, JOHN ARCUDI, and Frank Miller. Art by LEINIL FRANCIS YU, Billy Tan, DALIBOR TALAJIC, ERIC CANETE, Herb Trimpe and Mike Esposito. Cover by Stuart Immonen. The steel-skinned Avenger shows exactly why he's one of Earth's Mightiest Heroes! Discover how young Carl Lucas, imprisoned for a crime he didn't commit, gained his powers and became the hero he is today! As Civil War rages, Luke picks a side and makes a stand - but it might divide him from his wife, Jessica Jones! But when their daughter, Danielle, is captured by Skrulls, Luke will make a deal with the devil to save her. Then, a ghost from Luke's past takes him back to the Hero For Hire biz - and a classic street level team-up pits Luke, best pal Iron Fist, Daredevil, Moon Knight and Spider-Man against the Kingpin and Killgrave the Purple Man! 1st printing. 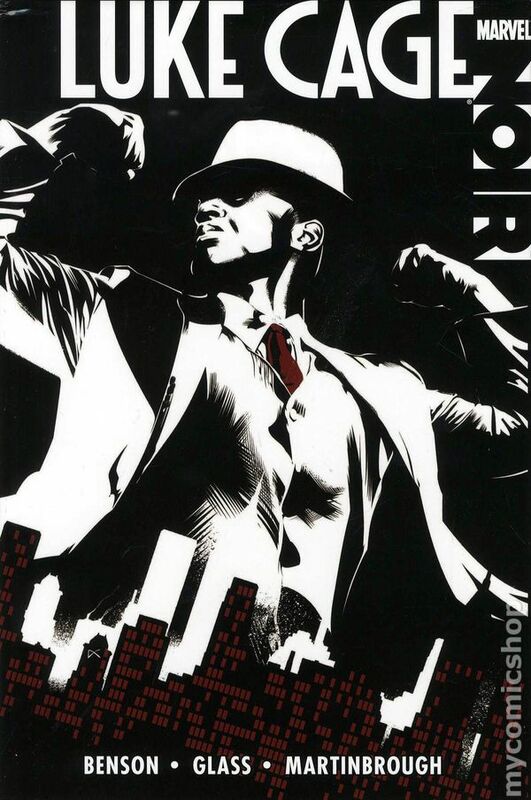 Collects Luke Cage: Noir (2009) #1-4. Written by MIKE BENSON and ADAM GLASS. Art by SHAWN MARTINBROUGH. Cover by DENNIS CALERO. A lot can change in ten years. And rarely for the better. 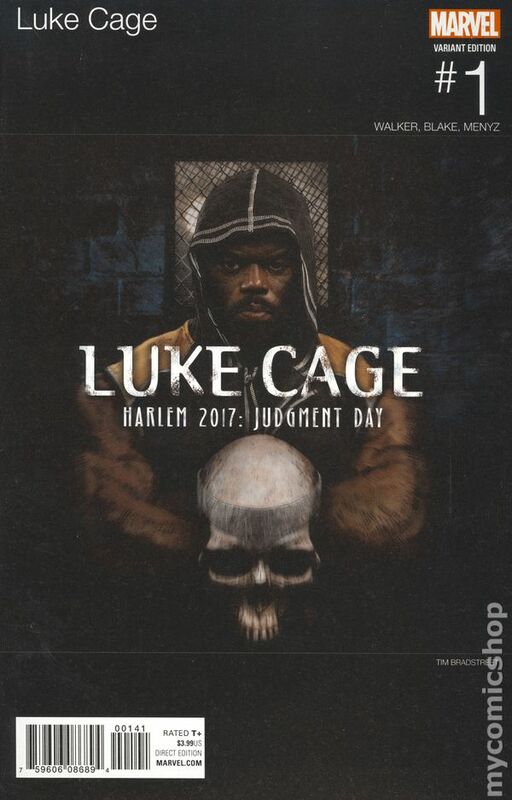 Local legend, Luke Cage, invincible, unstoppable, unflappable, finds that out the hard way when he returns to the mean streets of Prohibition-era Harlem after a ten-year stretch in Riker's Island. All he wants is to be back in the loving arms of his woman, but certain powerful men have different plans for Cage. Willis Stryker, Cage's childhood friend turned Godfather of Harlem, wants him on his crew, and under his thumb. And wealthy white socialite Randall Banticoff, whose wife is now very dead, murdered in a Harlem alley, wants Cage to investigate her death. Cage is about to learn that coming home is never easy, and to survive he might just have to kill a whole lot of people. Hardcover, 112 pages, full color. Cover price $19.99. Volume 1 - 1st printing. "Sins of the Father!" 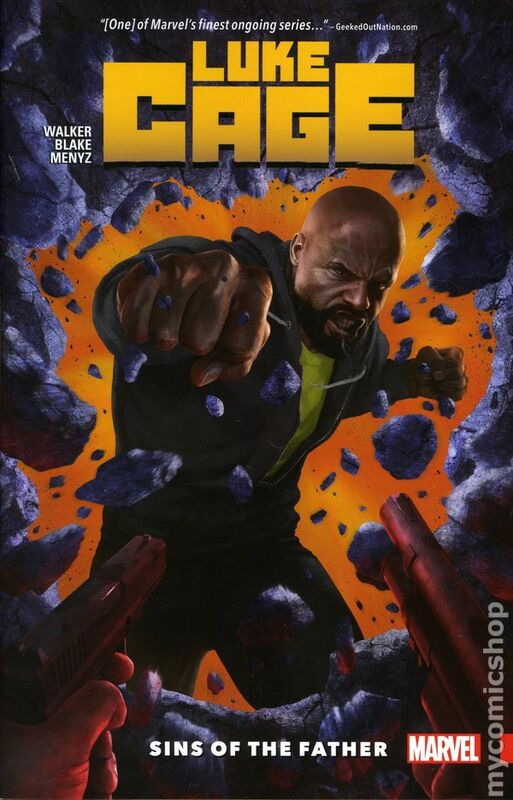 Collects Luke Cage (2017) #1-5. Written by David Walker. Art by Nelson Blake. Cover by Rahzzah. The man who made Luke Cage into the unbreakable hero he is today, Dr. Noah Burstein, has died. But when Luke heads to New Orleans for the funeral, it turns out there may be more to his father figure's death than he realized. Shady billionaires, amped-up gangs and a shadowy figure from his past propel Luke into a world of mystery. But when Cage is looking for answers, it's a bad day for anyone in his way! As things get hard in the Big Easy, Luke must put body and soul on the line to learn the truth and protect the innocent - but innocence is in short supply. And as strange forces align, Luke comes under attack from all sides! His adversaries are rich, powerful and nigh invincible - but he's Luke Cage. Bring 'em on! Softcover, 112 pages, full color. Cover price $15.99. 1st printing. 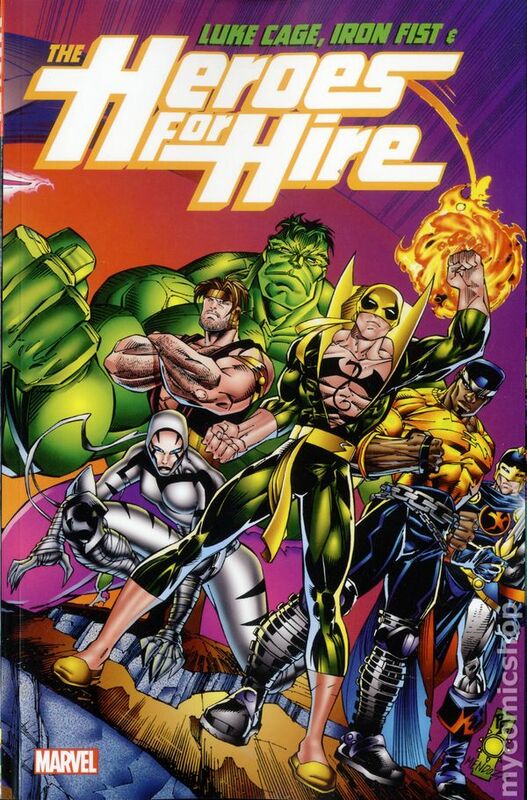 Collects New Avengers: Luke Cage (2010) #1-3, Daredevil: Cage Match (2010) and Power Man and Iron Fist (1972-1986) [HERO FOR HIRE] #1. Written by JOHN ARCUDI and ANTONY JOHNSTON. Art by ERIC CANETE and SEAN CHEN. Cover by ERIC CANETE. 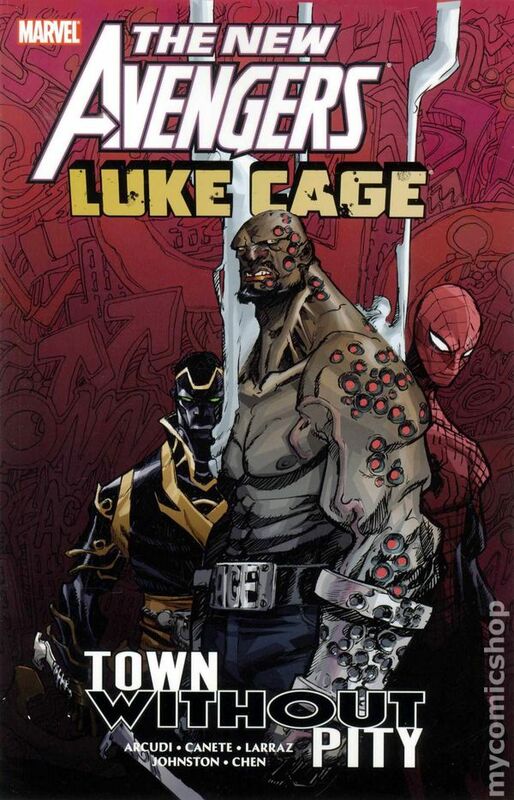 When an old friend from Luke Cage's past is put in the hospital by a vicious attack, Cage leaves his New York City, Avengers Assemblin' adventure-filled life for the cold, harsh and mean streets of North Philadelphia. But what's brought HAMMERHEAD to town as well? JOHN ARCUDI (Wednesdays Comics) and ERIC CANETE (AMAZING SPIDER-MAN) team up to bring you this hard hitting, two-fisted look at the seedier sides of the Marvel U as the original Hero for Hire gets back to work in NEW AVENGERS: LUKE CAGE! And in CAGE MATCH, we look back at a bit of brutal history between Luke Cage and Daredevil, revealing a mutual respect that may soon be torn asunder. Softcover, 120 pages, full color. Cover price $14.99. 1st printing. 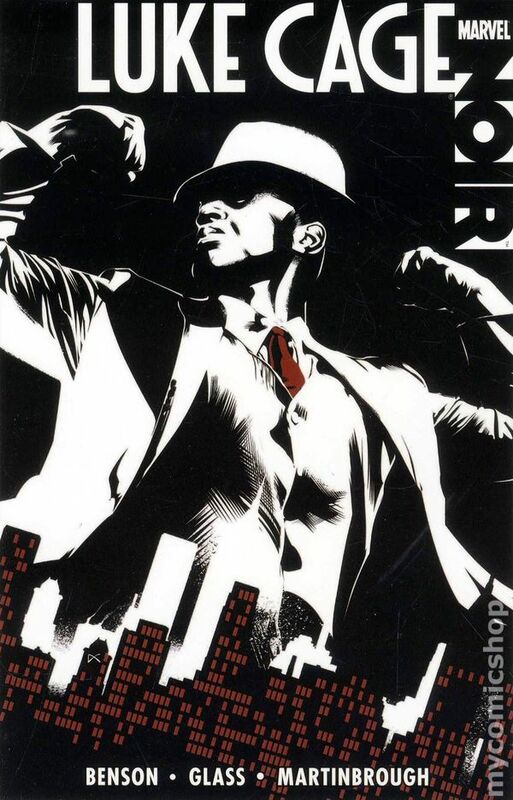 Collects Luke Cage: Noir (2009) #1-4. Written by MIKE BENSON and ADAM GLASS. Art by SHAWN MARTINBROUGH. Cover by DENNIS CALERO. A lot can change in ten years. And rarely for the better. 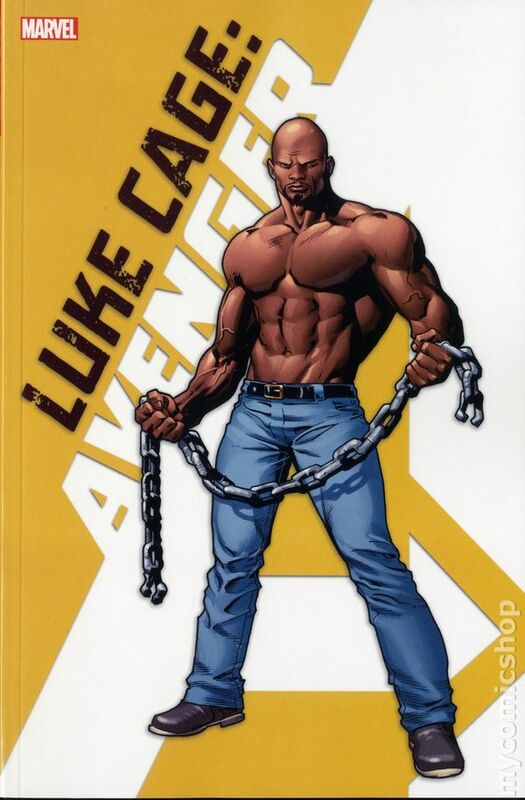 Local legend, Luke Cage, invincible, unstoppable, unflappable, finds that out the hard way when he returns to the mean streets of Prohibition-era Harlem after a ten-year stretch in Riker's Island. All he wants is to be back in the loving arms of his woman, but certain powerful men have different plans for Cage. Willis Stryker, Cage's childhood friend turned Godfather of Harlem, wants him on his crew, and under his thumb. And wealthy white socialite Randall Banticoff, whose wife is now very dead, murdered in a Harlem alley, wants Cage to investigate her death. Cage is about to learn that coming home is never easy, and to survive he might just have to kill a whole lot of people. Softcover, 5 1/2-in. x 8 1/2-in., 112 pages, full color. Cover price $14.99. Volume 1 - 1st printing. 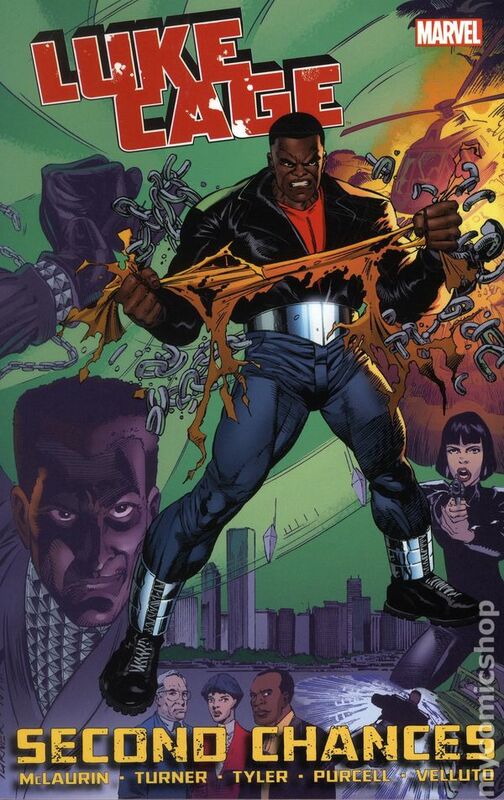 Collects Cage (1992 1st Series) #1-12 and material from Marvel Comics Presents (1988-1995 1st Series) #82. Written by Marc McLaurin. Art by Dwayne Turner, Gordon Purcell, and Sal Velluto. Cover by Dwayne Turner. Power Man no more! Harlem's favorite son is ripping up the silk shirt and getting back in the game as Luke Cage, Hero for Hire - and he's working overtime! With Chicago as his new home, it's no surprise Luke soon has his hands full with the Untouchables! And that puts him square in the Punisher's sights. Bullets are one thing for a guy with steel-hard skin, but he'll need a power upgrade before locking horns with the Rhino and butting heads with the Hulk! It's far from a sweet Christmas when a new foe strikes - one with ties to one of his greatest enemies! With his family's lives at stake, Luke sure is a friend in need. Good thing Iron Fist is his friend indeed! Softcover, 320 pages, full color. Cover price $34.99. Reprinting POWER MAN #30. Rated T Cover price $1.00.